A car expo might not be the most obvious place to unveil a new jukebox – after all, how will your disc-changer handle the potholes? 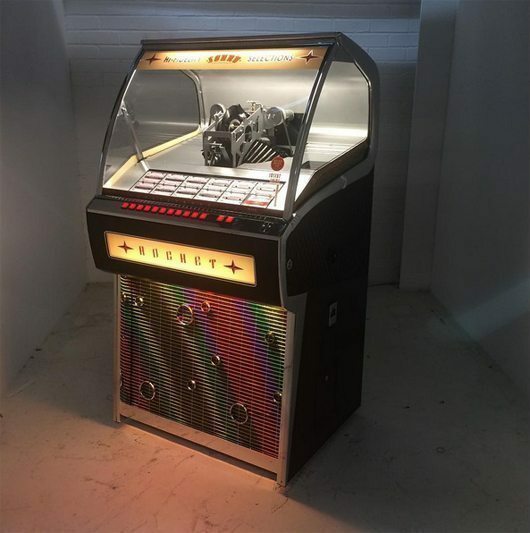 – but that didn’t deter Sound Leisure, a Leeds-based company quite rightly proud of announcing the first commercially available vinyl-playing jukebox in two decades. The prototype, revealed at the Classic Car Show at London’s ExCeL Centre this past weekend, offers a taste of what’s in store when the vinyl-playing Rocket Jukebox goes into production this summer. Besides, the clue’s in the name. The company’s evocatively named Rocket series has been named after ‘Rocket 88’, the 1951 song that’s often hailed as the first ever rock’n’roll recording. A paean to the vintage car of the title, the song was credited to Jackie Brenston And His Delta Cats – actually Ike Turner’s King Of Rhythm in disguise. Fittingly, the jukebox looks the part, too, combining, as Sound Leisure themselves put it, “a vintage 50s look with 21st-century performance”. Noting the difficulty of trying to find “people with the skills and knowledge” to be able manufacture a jukebox with changer mechanism that could accommodate 45s, Black called the task “a project of epic proportions”, adding that many of the production team involved were in their 70s and 80s. It’s also the stuff of fantasies for vinyl-lovers old and new. As reported earlier in the year, HMV announced that they sold one record deck per minute in the run-up to Christmas, and sales of the black stuff are continuing to rise, so this new-look Rocket Jukebox is well timed. To paraphrase Brenston’s song: it looks great, we just can’t wait.